wendy house » Blog Archive » what do the pyjammas say? what do the pyjammas say? There is a trend amongst the young adult girls of Seattle. I’ve not noticed boys indulging in this fluffy passtime. The trend is wearing your pyjamma pants as everyday wear. What does this dressing choice say? Possibly it’s a variation on the notion of ‘come to bed eyes’, ‘come to bed pants’? Maybe it’s a way of expressing how ‘laid back’ you are “I’m so laid back I didn’t even bother getting dressed this morning“. Could it be that these girl’s objected to the storyline of ‘Sleepless in Seattle’ and they’re making a point about the fashion industry, they’re awake in Seattle and not following the store-based clothing classifications. A wee rebellion against the fashion industry. Hoorah! The folded arms, ankles-crossed, pony-tails, multiple uncoordinated colours, jacket shorter than t-shirt and trainers (US = sneakers) are all optional extra’s but definitely part of the core ‘look’ I see the local girls stylin’ in. I may have to try this out to get the full experience of the fashion-rebellious pyjamma’s as outer-wear thing. Like wearing other people’s clothes, but not quite since I will have to purchase my own Hello Kitty Pyjamma pants. This scribble was published on Tuesday, December 26th, 2006. You can follow any banter on this scribble with the RSS 2.0 feed. You can share your inspired musings after typing the anti spam word near the bottom of the page. But no Pinging because its too naughty. 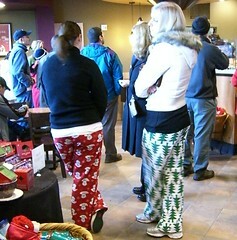 When it is chilly enough to cause young women in Florida to wear something other than shorts (i.e., below 70 F), they too often wear pajama bottoms in public. I hope it’s a rebellion against the fashion industry. High time for a revolution in that quarter.